The KBMG Series of DC drives by KB Electronics can be used to operate DC PM or Shunt motors in a bidirectional mode. KBMG drives are regenerative DC drives that are full wave and ultracompact. They have 4-quadrant action with forward and reverse torque in both speed directions. Constant speed can be maintained with overhauling loads as well as controlled braking and rapid reversing. KBMG DC drives may replace servos in a number of applications due to their excellent controllability and response time. These drives have a built-in, factory-calibrated selectable motor current jumper, which eliminates the need to recalibrate IR Comp and Current Limit for most applications. These also feature an Enable function for starting and stopping the motor electronically, as well as KB Electronics’ exclusive Auto Inhibit (R) circuit, Overspeed Protect Circuit, and many other features. • Auxiliary Heat Sink (Part No. 9861) – Increases the control rating to 1 HP at 90 VDC and 2 HP at 180 VDC. Dimensions (L x W x H approx. ): 7.0” x 6.3” x 1.9”. • SIMG Bipolar Signal Isolator (Part No. 8832) – Allows a non-isolated signal source to be used. • Multi Speed Board (Part No. 8833) – Provides discrete preset speeds which can be controlled from a PLC. • DIN Rail Mounting Kit (Part No. 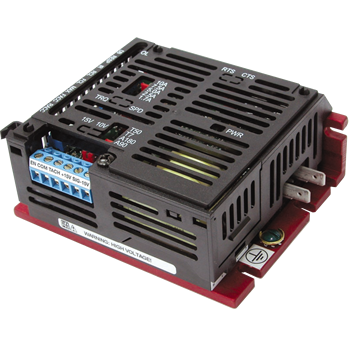 9995) – Converts control to standard DIN Rail Mounting.